People believe in hell for other people, for those who do awful things. Maybe someone has gotten away with a horrible crime and hasn't been caught. So we say, "Well, they will get theirs." What we are really saying is there is a final judgment. However, we don't like the prospect of facing judgment ourselves. Yet if a person ends up in hell, that is his or her own choice. This is not what God wants. Hell is a prison in which the doors are locked from the inside. Heaven is not the default destination of every person. 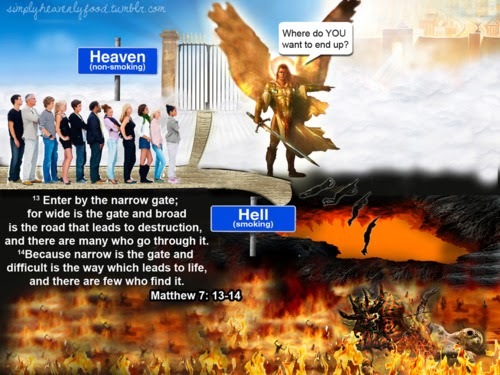 Jesus said, "Enter by the narrow gate; for wide is the gate and broad is the way that leads to destruction, and there are many who go in by it. Because narrow is the gate and difficult is the way which leads to life, and there are few who find it" (Matthew 7:13–14). We go to heaven because we make a choice to do so by putting our faith in Christ—and Christ alone. There is no other way to get to heaven. No one was uniquely qualified to meet God's righteous demands apart from Christ. No prophet, no guru, no religious system is going to do it. Jesus was fully God, and He was fully man. Thus He, and He alone, was able to stand in the gap for us and pay the price for our sins. That is why the Bible asks, "How shall we escape if we neglect so great a salvation, which at the first began to be spoken by the Lord, and was confirmed to us by those who heard Him . . . ?" (Hebrews 2:3–4). If you blow off God's offer, that is your choice. But you are going to face the consequences. This was a powerful Devotional from Pastor Greg Laurie today. All I can add is that I am so happy that I have Jesus Christ as my Lord and Savior!!! I can’t imagine my life without Him as my Lord and Savior. God bless you!! !